Our software is so effective because our supply chain experts know as much about manufacturing best practices as they do programming. We don’t just keep your system up and running. We keep you successful. If you’re like many of our clients, you have enterprise systems to integrate; questions about our implementation methodology and timeline; and what type of ongoing support—before, during and after—that you can expect from Synchrono. Below is an overview of the services we provide. Our signature service program delivers continuous improvements so you maintain your competitive advantage today and tomorrow. 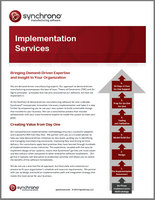 Our comprehensive six-phase implementation methodology ensures a successful adoption and a meaningful ROI. We model a system for your environment, implement the solution, transform your business processes and offer ongoing services and support. 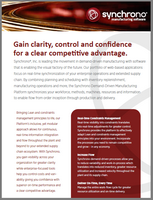 Synchrono software is web-based and developed in .NET for its ubiquitous nature and easy integration. We have a collection of web services that enable integrations with a wealth of third party systems – and very likely, yours.